The first time we heard Brit dance-pop artist La Roux, who teased us with just two singles for months before releasing her Bulletproof LP in the US, finding additional tracks from the album became somewhat of an obsession. The lines blurred between want and need. It was a dark time. So when we first heard MS MR’s sweet, La Roux-like vocals backed by hardy backbeats and synth violins, we admit, we got a little nervous. Please, not this again. 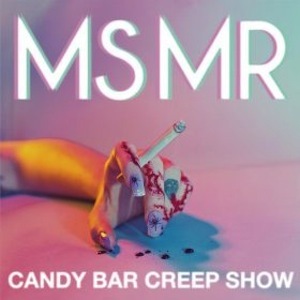 We are happy to tell you Owls, we have found an artist who understands our neurotic, spoiled music needs in MS MR. You won’t have to wait for this New York dance attack to release their four-track EP Candy Bar Creep Show, because not only will the album drop September 18, but MS MR is offering it now, like an open bar, for streaming on their Tumblr page. We’d salute you, MS MR, if we weren’t so busy breaking it down to your glitch-poppy tunes right now. Unfortunately, the band seems to be avoiding the West coast on their international tour with Grouplove (was it something we said? ), but New Yorkers can catch them on their home turf at the CMJ Music Festival October 18.